alaTest has collected and analyzed 49 reviews of Canon DC 22. The average rating for this product is 3.2/5, compared to an average rating of 4.0/5 for other Camcorders for all reviews. Reviewers are impressed by the size and image quality. The portability and price are also appreciated, whereas opinions are divided on the color. Many are critical about the zoom and design. We analyzed user and expert ratings, product age and more factors. Compared to other Camcorders the Canon DC 22 is awarded an overall alaScore™ of 82/100 = Very good quality. alaTest has collected and analyzed 18 user reviews of Canon DC 22 from Amazon.com. The average user rating for this product is 2.7/5, compared to an average user rating of 3.9/5 for other Camcorders on Amazon.com. Reviews about the size and reliability are overall positive. The image quality and usability also get good feedback. There are some mixed opinions about the price, and there are some negative views about the color and design. 44% of the reviews on Amazon.com give this product a positive rating. 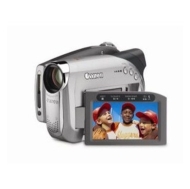 The Canon DC22 is a user-friendly digital DVD camcorder that records stunning quality widescreen movies direct to DVD. One-handed operation and a 2.2 Megapixel CCD make advanced technology effortless. Flash photography is possible with the Canon DC22′s built-in flash. Buy at least one extra battery and a charger. A battery can be charged in the camcorder, but who wants to sit and wait for the charge to complete when you could be out having some fun with a very nice camcorder. This is a simple dvd camcorder. My husband bought it for me for my birthday. I use it often and love it. No problems with it yet. This was a replacement unit that was installed at 35,000 clicks on the copier. This one was perfect -- no scratches or defects on the blue drum -- contrary to the one it replaced at 22,000 clicks. With a 2.2MP CCD and an RGB Primary Color Filter, the DC22 captures the colors you see in panoramic 16: 9 widescreen. Record straight to DVD (-R/-RW/-R Dual Layer), finalize the disc in-camera, then transfer it directly to a home DVD player to relive the moment. Traditional 4: 3 shooting is easily selected with the push of a button. The DC22's lightweight body is designed with one-handed operation in mind. Easily accessible controls are grouped together on the back of the camcorder, making it a user-friendly, take-anywhere device. Part of Canon's second generation DVD line-up, the DC22 is compatible with a wider range of DVD formats, including DVD-R Dual Layer. Greater capacity means generous recording times: from 36 minutes at best quality to an impressive 108 minutes at the most efficient setting. The DC22 has a 2.7" 16: 9 widescreen LCD, allowing you to keep an eye on the action exactly the way it is recorded. A horizontal level marker on the LCD helps you to find the right shot every time: anti-glare coating means that the screen is visible even in direct sunlight. Connect the camcorder to other peripherals via AV input to transfer analog recordings to DVD quickly and easily. With an advanced Electronic Image Stabilizer, the DC22's 10x optical zoom lens reduces camera shake, even when shooting at the limit of the zoom. The DC22 records audio in two-channel Dolby Digital sound, for superior quality and a more rewarding viewing experience. The DIGIC DV image processor provides images in vivid, life-like color. Split path processing handles video and still signals separately ensuring optimal output - whatever and however you shoot. Advanced still photography functions make the DC22 a powerful and versatile digital imaging tool. Photos are captured to either DVD or Mini SD card: saving them on a memory card allows you to take photos at the same time as you're shooting video. A white LED video light enables close subjects to be shot in color in low light. A built-in flash for digital photography is also provided.